Long cords to be worn over graduation gown or draped around the neck. Color: Rainbow. 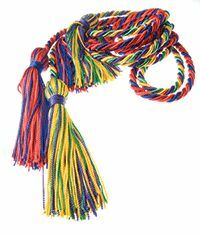 Wear cords separately or coordinate with the mortarboard tassels for graduation ceremonies. Mortarboard tassel comes complete with a gold metal tassel band with the year of graduation. Color: Rainbow. Great for graduation ceremonies.